It's About Knitting and Other Stuff...: Northmavine Hoody - prep! Here we have more stripes, but I'm not having quite the sense of foreboding I had with the baby-gro of doom. Instead I have a sense of setting off on a quite long but enjoyable project which will keep me warm on festival evenings thissummer. Here is the start of my Northmavine Hoody. I ordered the yarn for this by guessing what the actual colours would be from the photos on the Jamieson and Smith website. Somewhere I have a shade card but who knows where exactly? and don't I say every six months I really must get a bit more organised stash wise? Yes, I do. I bought it on a cone as that was more economical (I am from Yorkshire, it's in-bred). Before it got to mermaid hair stage though there was a process to go through. When yarn comes on a cone it's got oil in it - some people like the smell but I can't stand it. Of course I have Herdy tea towels! 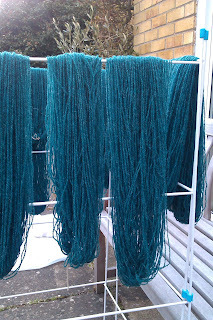 Then washed the many, many skeins in the bath and hung them out to dry in one of the only sunny days we had in early spring (see above). A rare sighting of a swatch in this knitter's house. I started on 3mm needles but it pretty soon became clear that wasn't anywhere near gauge, so went down to 2.75 (hence the black line halfway up, that's not part of the colour scheme). I also did an alternative colour placing halfway up the second half, which I prefer.